More details about Omni's preliminary proposal -- along with concept renderings -- are after the jump. The Albany Aquarium group -- which has been rallying support for the idea on Facebook -- announced that it's organizing a public meeting July 15 at the Albany Public Library main branch. The goal: to "outline their vision and solicit public feedback." We heard today Nancy Behrens, who's been leading the Albany Aquarium effort, has had a meeting with Omni president DavidÂ Swawite. "It was a very positive meeting and is encouraging to know that they support the idea of the Albany Aquarium. I hope to continue the discussion with them in the days and weeks to come." Omni Development Company, Inc. has been at work on a substantive plan to help achieve the success that everyone desires for the future of downtown Albany and the entire region. It is a future with an exciting community image, enormous economic potential, and is long overdue. The concept is to develop a world-class aquarium, including an IMAX theatre and a science and technology museum -- a compelling visitor attraction, a durable cultural/family asset, and an exciting educational force. There are a number of extremely successful such complexes in the United States today, so the benefits are proven, not speculative or based on mere opinion. Better still, there is nothing like it in our region, making it unique across a wide marketing geography. The economic impact promise is outstanding. Downtown aquariums have not only revitalized cities and downtowns, but have demonstrated long-term capacity to draw people from surrounding communities. Retail and service industries would proliferate and thrive. It would simultaneously serve as an educational and research institution for pre-school through graduate degree levels for outreach, science and ecology studies. Albany is uniquely positioned, by virtues of geography and community assets, to make this an exceptional success and visitor destination. Firstly, as many are aware, Albany is a natural meeting location for many types of organizations, and the aquarium complex would be an entirely new venue for visitors to come here more often, stay longer, and increase spending throughout the community. Secondly, as a leading educational center, the potential for academic and research programs is excellent. Thirdly, the work force is available to fill jobs created by the aquarium complex itself, and the many other existing and new businesses that will benefit from the increased visitation. Aquarium complexes are already proven economic engines in numerous cities, as well as centers that define the quality of life and access to all for superior educational entertainment. Two outstanding examples are the National Aquarium in Baltimore, and the world's largest aquarium, The Georgia Aquarium in Atlanta. Yet, it is not just larger cities that can benefit. 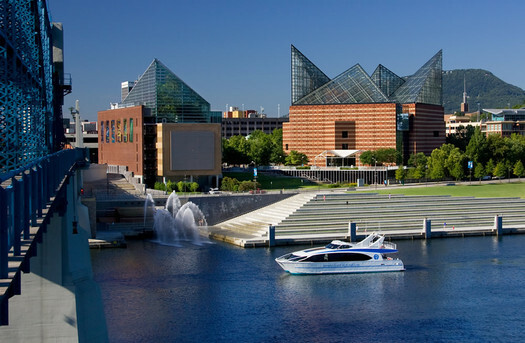 One of the best and most visited aquariums in the country is the Tennessee Aquarium in Chattanooga. The Chattanooga market is somewhat smaller than Albany/Schenectady/Troy, but close enough to provide a useful, conservative comparison. And since Albany is larger, we could reasonably expect to achieve even greater success. The Chattanooga market population is 535,000 in 213,000 households, and Albany/Schenectady/Troy has 872,000 persons in 355,000 households. Our median household income is $63,000 compared to Chattanooga's $48,000. And, Chattanooga is about 120 miles from Atlanta with the world's largest aquarium, so that situation is roughly equivalent to our juxtaposition/competition with New York City. Attendance at the Tennessee Aquarium in 2011 was 657,443 with an economic impact of $77.4 million/year. Aquarium revenues were $19 million in 2010. Employment is 150, plus 650 volunteers. Capital funding was $45 million initially (opening in 1992), plus $35 million for a subsequent major expansion. Such results for Albany would produce major new growth, new income, new jobs, and a greatly enhanced reputation for community leadership and fiscal resourcefulness. Moreover, with a strong emphasis on family visitation, the concept offers sustainable vitality -- it is not a fad or trend that fades. As long as there are new families, and new children growing up, there will be a naturally replenishing market of visitors for whom an aquarium has magnetic appeal. 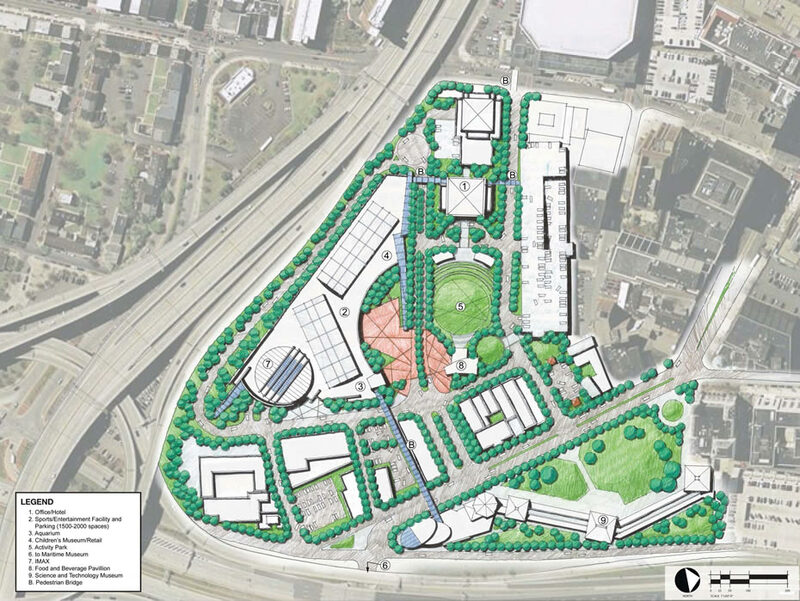 It would be astute for the Convention Center Authority to take the role of developer, and move ahead promptly: CCA owns the land, has major funding available, and has accomplished much site work. And, should a major commercial tenant show interest, Omni owns a contiguous site with preliminary plans prepared to satisfy a variety of large space needs, including perhaps a hotel. We at Omni know that a properly developed aquarium complex will bring extraordinary success, and usher in an exciting and economically vigorous future. Omni is an Albany company with decades of experience in developing Albany's commercial and residential assets. We are guided by our love of this beautiful area and the conviction that a great future is at hand. We hope that concerned residents, community leaders and the Convention Center Authority will join us in taking the necessary steps toward this new public/private partnership -- achieving a gleaming image and a cultural treasure for all families, residents and visitors to experience and enjoy. I lived in Chattanooga for about 10 years. The positive impact it had on a small southern city was very positive on many levels (cultural, economic, aesthetic). An impressive aspect was that the push to build the aquarium was lead by private leadership and investment. The Tennessee Aquarium in Chattanooga is designed to illustrate how our waterways and aquatic life are closely tied to our climate, economy, culture, etc. Like Albany, and many other cities, early economic development was tied closely to its waterways. Obviously the focus is on ecology and animal life, but the opportunities for educational programs range far beyond just biology,ecology, etc. I will also note that an IMAX theatre was built within a block of the aquarium shortly after the aquarium opened. I could see this as a nice tourist attraction for Albany. Additionally, though, I imagine educational programs that could be presented in concert with other resources in Albany (Albany Institute of History and Art comes to mind). There are two major aquariums in Mystic and Boston each about 160 miles from here. How about something original? Will Omni build a matching monorail? Seriously- downtown Chattanooga was revived through much more than building the aquarium. It was revived through a long, long, long comprehensive public planning process that gathered input from all stakeholders. In the end, the aquarium concept (which was one of many) was chosen, supported, and promoted by the community. No one rolled out a completed aquarium plan in a press release and sold it as the solution to downtown Chattanooga's problems. The horse goes in *front* of the cart. How do they plan on turning SUNY Central into a Science and Technology musuem? This is a fantastic idea for Albany. @Ron, driving 160 miles would be costly for a lot of families. Besides, do YOU have a better more viable idea? Perhaps Mayor Jennings should follow Baltimore's Mayor Donald Schaefer's lead. "Schaefer wasn't particularly interested in seeing Boston's aquarium. But after Schaefer toured it and realized its potential, he was hooked -- and wanted one for Baltimore." He was later elected Governor of Maryland. As someone who was on the opening team of the National Aquarium in Baltimore I saw first hand the powerful transformational effect that these institutions can have on a city. The choice of Chattanooga as a comparison to Albany is a very apt one. The first phase of that aquarium did a great job of interpreting the Tennessee River from its source in the Appalachians all the way to the Gulf of Mexico. The Hudson River deserves a similar tribute. Bill Moyer's described it well; "Although only 315 miles long and tucked away in the Northeast corner of the nation, the Hudson River has been called Americaâ€™s river. Thatâ€™s because it courses more intensely through the heart of American history, commerce, and culture than perhaps any other river. The strategic key to the American Revolution, a vital transportation artery for a fledgling nation, and an enduring source of spiritual and artistic inspiration, the Hudson River has also been the victim of brutal abuse and a blazing battleground between public and private interests. The catalyst for the conservation movement of the 19th century and the environmental movement of the 20th century, the Hudson River is a paradigm for the ceaseless conflict between Americaâ€™s love of nature and its restless growth. . . Bill Moyers travels from New York Harbor to the Adirondack Forest to explore the dramatic history, complex ecology, profound natural beauty, and far-reaching legacy of what has been called "Americaâ€™s most beautiful, messed-up and surprising piece of water." There are some significant stories to tell about the Hudson, Erie Canal and the Adirondacks. The exhibit team who developed the Tennessee Aquarium did a great job of intertwining cultural or historical elements into the interpretation there. It's a great model for what Albany could develop. Like the convention center, and the many other ideas for transformation in Albany, this will give us something new to talk about and debate the merits of. Ultimately though, I'd be willing to bet that this idea will end up being no different than past ones - lots of talk that never goes anywhere. A proper showcase for Albany beef? 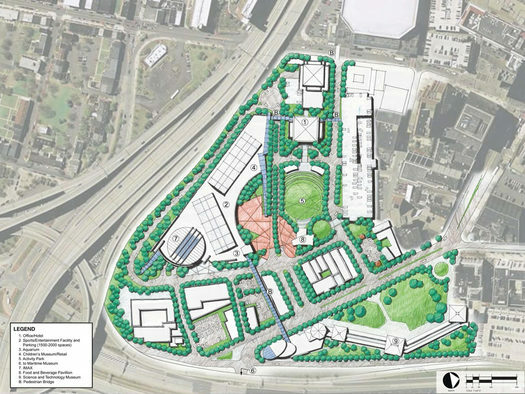 Omni's proposal encourages the Convention Center Authority to "take the role of developer, and move ahead promptly." I'm not sure that the CCA has the legal right to do anything other than what it was originally created to do: develop a convention center. So of course there's pushback from the CCA, whose leaders have not yet given up on their plan. Secondly, the aquarium in Chattanooga may be world-class and wonderful, but every community has its own assets and challenges. A market study needs to be done to determine whether this entire concept (not only the aquarium, but also the science museum, IMAX theater, etc.) is feasible. It's all well and good for people to say, "This would be fantastic... a great attraction for Albany," etc. A market study by a qualified consultant would take into consideration a wide range of factors: area demographics, likely demand, competition with similar facilities locally or in nearby cities, financing options, and so on. Omni doesn't seem to want to pay for such a study, but who will? @Monorail is right - you have to put the horse in front of the cart! I think the site should be put to use, but not at taxpayer expense. The convention center authority should try to sell off the parcel to whatever developer wants it, and has a plan to develop it. This is the best idea going for the city of Albany. I can't think of another idea that is solely designed to bring in tourists as well as natives into the Downtown Area. HQ is equally silly. If State Workers in that area were unable to keep it afloat, what makes anyone think CDPHP will? The idea for the land is something that will have a continual draw into downtown Albany, including weekends and holidays. The options are endless when you go with the Aquarium. What's infuriating about Albany is the lack of action on ideas, and the lack of looking into the future. Albany wants to be seen as this destination city, well this is the thing that will get it there and instead it's being stymied by a couple of clowns. Of course the Aquarium was not the only factor in Chattanooga's revival. Much of what they had to do in Chattanooga, Albany already has going for itself, and there are other parts that Albany could improve upon. Chattanooga completely redeveloped their waterfront; converted an old railroad bridge, that crosses the Tennessee River, into the worlds longest (at the time anyway) pedestrian bridge; had an entire art community built (with private funds) adjacent to their art museum; etc. I don't think anyone is really trying to put the cart before the horse. Those of us supporting the idea (at least myself) would agree that the building phase is not going begin tomorrow. Certainly there are a lot of factors to consider, market studies, funding, etc. Getting excited about an idea and realizing that many things need to be taken into consideration before any decision is made are not contradictory positions. I will also add that, I agree that this is not a standalone revival plan; there needs to be an overall comprehensive plan. That requires leadership from the community including elected officials, residents, private investors, etc. Also - dialogue like this is valuable too! If a company wants to buy property downtown and use its own money to build an aquarium, then by all means let them do it. But in NY, everything like this winds up being publicly funded. Why? If a convention center or an aquarium would be so popular, then presumably they will be profitable, right? If so, why not leave projects like this to the private sector? But of course they won't be profitable, and private companies would not throw their money away like that. As long as government officials are willing to throw our money away, developers would be thrilled to take it. Seriously... An aquarium? In a dying city like Albany, that is what you think we need to buy with taxpayer dollars? It really is hopeless if you go any farther down this pad. Can't we just make it a Convention Center featuring an aquarium? But seriously, aquariums are a draw for everyone, including whoever books convention centers. I for one like the idea of an aquarium and most folks I speak to do as well, though I think the need for an economic study is important and prudent. With that said, I think the community has completely missed the bigger picture here as it relates to the Omni Development proposal, which goes much further than merely a "Big Fish Tank" downtown. The proposal calls for significantly more bang for our buck on this site than the current convention center concept by offering retail, commercial, educational (museum and aquarium), entertainment (IMAX theater) opportunities, that in my mind, are an excellent mix-used build-out that complements the hard work already accomplished downtown over the past few decades. I think this proposal will help expand on the â€œentertainment districtâ€ that has been cultivated downtown, allow for a museum mile of sorts by complementing the current institutions in the area (NYS Museum, AIAH, Irish Museum, growing art galleries downtown, soon to be developed Capital South Campus, etc), and bring retail to the growing number of residents moving downtown or for the commuter crowd to take advantage prior to heading home after work. In my mind, this holistic development would bring far more to the community on a day to day basis than the convention center, which arguably would help downtown businesses, but ultimately would be utilized by users who would be in for the event and out the next day. I know I would get limited utility out of a convention center and would love to be able to take the bus downtown to catch a movie, do some shopping, eat outside in the new/current public spaces, and simply people watch, as a downtown should allow for. I think this will be an amazing thing for the capital area and really bring in people from all over to see and learn new things. meany of the really good aquariums are so far away and schools and family's can travel all that far in today's busy world. i also would be interested in apply for a job to at the aquarium is there any word on that? or getting involved with this project?